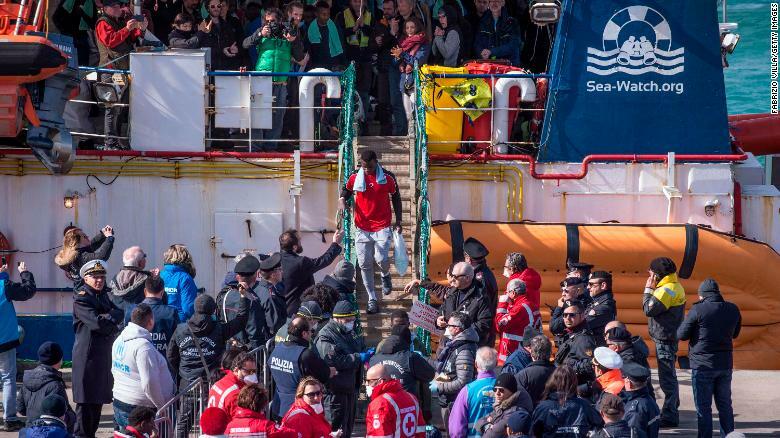 The migrant rescue organization Sea-Watch has accused Italian authorities of inventing irregularities to block its ship from leaving the port of Catania, delaying its return to patrolling the Mediterranean Sea. The Italian Coast Guard said Friday that the ship would be prevented from leaving until it rectified “safety of navigation” faults and other issues. On Thursday, after waiting for nearly two weeks for the Italian government’s permission to come ashore, Sea-Watch 3 disembarked 47 migrants in Catania. The impasse ended after five European countries offered to take in the migrants — an ad hoc solution that has become increasingly common since Italy’s hardline Interior Minister, Matteo Salvini, closed the country’s ports to migrant boats last June. Migrants aboard the Sea-Watch 3 vessel disembark in the port of Catania on January 31. In a statement, Sea-Watch said there was political pressure on the coast guard to block the ship from departing. “This is a clear political move, with supposed irregularities invented only to prevent the Sea-Watch 3 from sailing,” the German non-profit organization said. “While the United Nations stress the importance of civil sea rescue missions, Italy — under the protection of other European governments — turns the Mediterranean into a deadly human rights-free zone by hindering the last current active rescue vessel from its urgently needed rescue mission,” Bayer said, adding that Sea-Watch was confident its vessels comply with all technical and legal regulations. CNN has contacted the Italian government for comment. Since closing the country’s ports to migrant boats last year, Italy’s populist government has passed a slew of new anti-immigrant laws. Still, people continue to make the dangerous journey across the Mediterranean to Europe. So far in 2019, 5,989 migrants and refugees entered Europe by sea, according to the International Organization for Migration, which put the number of those who arrived in Italy during the same period at 202.